The beautiful thing about learning to cook is that you learn not only how to properly feed yourself, but you also learn how to control flavours and what happens when you mix this with that. I find cooking one of the most satisfying things in life and don’t know where I’d be if I couldn’t lose myself in the kitchen at least every other day. I believe that knowing how to cook is an essential life skill, but knowing how to cook with a frugal hand is an even greater skill. In a world where colossal amounts of food are wasted every day, it is vital to cook with consciousness and care. However before I go on, let me tell you a dirty little secret: I was once a wasteful person. I would buy ingredients only to throw them out some days later because I didn’t know what to do with them. I had good intentions, but I lacked skill and it just all seemed too hard. Finally I got tired of relying on someone else to do the cooking for me so I went from regularly microwaving Lean Cuisines to regularly cooking for myself. One of my favourite things in recent years has become “quick-sale” grocery shopping, which is actively seeking out ingredients that are heavily discounted because their grocery store shelf-life is running out. I love this because it’s an all-round win-win situation. I am buying food destined for landfill if it doesn’t sell, and it is significantly reduced in price therefore keeping my monthly food bill down. If you’re an individual who tends to worry that the produce won’t be fresh, or that there is something wrong with it, I can assure you it’s totally fine. The only drawback is that you never really know what you’re going to find that day because it’s luck of the draw, but frankly I find this exciting because it encourages me to be creative. You see, it’s a process and a really fun, adventurous one at that. Some days it’s a huge bag of carrots I’ll find, other days it’s pork loin. I love dreaming up new recipes around my quick-sale produce and getting into the throes of cooking with them. If you find yourself stuck for ideas, you have Google at your fingertips. I make sure that I’m not only getting the most out of my produce in terms of flavour, but that I’m also wasting very little of it. Spring onion (scallion) tops, onion skins, carrot peelings for example all go into the freezer for stock and trimmings from meat go to my cat who is impatiently curling herself around my legs. A wonderful book to read for inspiration on this very topic is Tamar Adler’s An Everlasting Meal: Cooking With Economy & Grace. Her book is beautifully written and offers many an idea for eating well with a focus on keeping key ingredients like good olive oil and garlic on hand, using up “ends” (vegetable peelings, stale bread, that last bit of milk in the carton etc.) and lots of ideas for what to do with them. 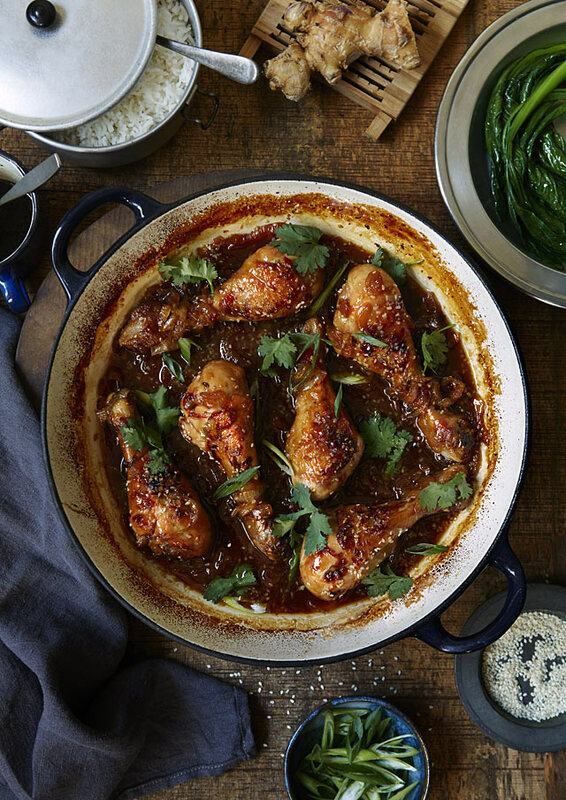 But back to this week’s recipe, these Chinese-inspired sticky and spicy drumsticks were thrown together after a shopping trip where I was able to buy several packs of organic chicken for a song. Generally speaking, I’m not a huge fan of the drumstick, finding most recipes with them a bit bland and uninspiring, however I can promise you that this recipe is anything but. 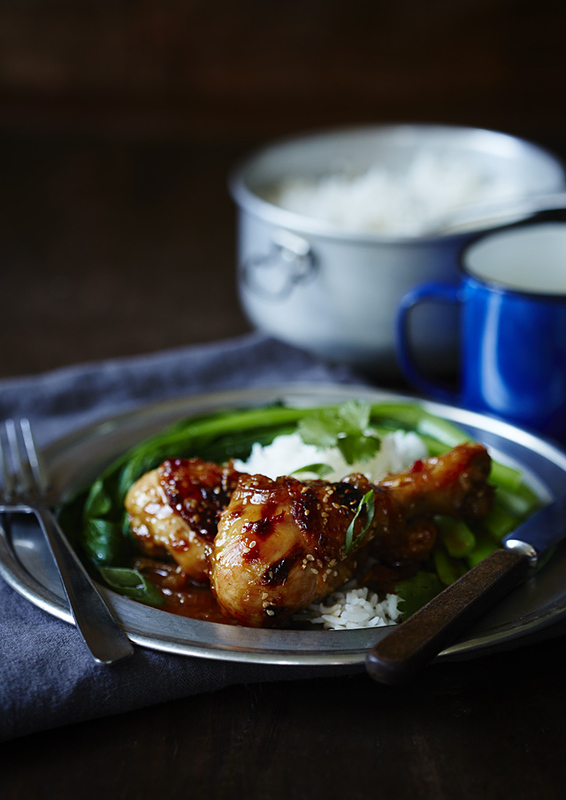 The sticky honey glazed sweetness paired with the spicy and salty garlicky flavours transforms what can be a boring cut of chicken into something really wonderful. It’s cheap to put together and tastes anything but. Eat them with your fingers, get a little sticky and enjoy every last bit with some hot rice to soak up the dark caramelized sauce. With the money you save on dinner that night you might even buy yourself a sneaky bottle of beer or wine, I know I did. Serves 4-6. Prep time 30 minutes, cooking time 75 minutes. 1. Preheat oven to 220˚C (approximately 430˚F). 2. Heat the oil in a heavy based shallow casserole pan and brown the chicken on all sides. Do two or three drumsticks at a time so you don’t crowd the pan as you want them to sear not boil. Set aside. 3. Scatter the chopped onions around the drumsticks. 4. Whisk together the honey, cider vinegar, tamari, sesame oil, ginger, garlic and chilli and pour over the drumsticks and onions. On the stove over medium to high heat bring the sauce to a boil, cover the dish and place in the oven for half an hour. 5. After half an hour uncover the dish and turn the drumsticks over in the pan to ensure they are cooking evenly in the sauce. Turn the heat down to 200˚C and place the dish back in the oven for a further 30 minutes. 6. Take the dish out of the oven and remove all the drumsticks from the pan. Mix the corn flour or arrowroot starch in the water to form a slurry. On the stove over medium heat slowly add the flour mixture to the sauce stirring constantly and allow it to thicken. Once thickened add the drumsticks back to the pan and coat them in the sauce. 7. Scatter over the sesame seeds, chopped spring onions and coriander (you can use both the leaves and stems). Serve immediately with rice and Asian greens. I’ve put together a range of props inspired by a working kitchen, much like the family kitchen I grew up in. My Chinese-born mother would forever be throwing together dishes much like this one out of seemingly nothing, only to have an entire feast on the table. The mismatch of kitchenware was quite intentional, and my own family’s kitchen was much like this. My father ate his lunch at work out of exactly the same type of tiffin container the rice is in, I found it at a garage sale for $1. The enamelled cast iron dish was picked up off a nature strip up the road from my house. (Crazy someone would throw it out just because it had a slight chip on the base.) The background surface, metal plate and blue enamel mug are also from hard rubbish collections. The wooden chopping block, little bowl and antique pewter plate are from local op shops and the tea towel is from textile designer Iveta Sarta in Latvia. The only lighting used in this image is window light. The drumsticks look scrumptious ! This looks absolutely delicious. Do you think this would work in a crockpot? Also, how many lbs would say the chicken was? Wow they look sticky and sauce and absolutely delicious! What you outlined here is one of the many reasons I want to learn how to cook. I’d like to know what I’m putting in my body and I know it can be cheaper, I just don’t know where to start. Especially if I’m cooking for just one. OH MY GOLLY!! I made this last night and it was super tasty! I did add more chili because I love hot hot hot! I am usually a little dubious about sticky glaze recipes, but this was definitely Sticky, Garlicy, Chilli, Gingery, Sweet, Yummy, Tasty!! And the chicken was soft and easily came off the bone! Will definitely be sharing your recipe! Thanks!! I just made this chicken dish tonight. Very happy, the chicken was flavoursome, and the sauce amazing. Absolutely the right amount of sweet, and bite. Tanya, has included recipe for a great sauce, I don’t like too spicy, but found this ok. Obviously if you prefer extra spicy, add more chilli. This will definitely be, a new regular staple, and forgot to mention, easy to prepare.